Added engine/mon_party_sprites.asm, engine/mon_party_sprites2.asm, and engine/menu/party_menu.asm. I'm getting a "Section 'bank32' is too big" error when I try this. Use hlCoord instead of coord hl, deCoord instead of coord hl, and aCoord instead of coord a.
I have not changed anything in any other file than what I've mentioned here. Really all I want to be able to do is just use the Pokemon menu icons from G/S/C :( so I guess what it comes down to is that I really just need it so the game displays two full sprite frames instead of two frames of mirrored halves. Surely it would be less complicated than all this? What text editor are you using? That last error reminds me of the stuff that happens when you use notepad instead of Notepad++, and notepad screws up your line endings and stuff. I've been using Notepad++ so far! hlCoord is the old version of coord hl just like Func_71882 is the old version WriteMonPartySpriteOAMBySpecies. The code you're copying is old and some of the labels have been renamed since that code was written. Unknown symbol 'Func_71882' means that Func_71882 is referenced, but it does not exist. It indeed does not exist, because now it's called WriteMonPartySpriteOAMBySpecies. callba Func_71882 attempts to call a function called Func_71882, but since no such function exists, it doesn't know what to call. Replacing callba Func_71882 with callba WriteMonPartySpriteOAMBySpecies will fix this issue. However, you'll run into one error like this one for every label mismatch. Copy-pasting his code straight away isn't going to work because there are a lot of functions and addresses whose labels have been updated since it was written nearly two years ago. You should stick to porting only the necessary changes of each file to your own repository, rather than the whole file because otherwise you're going to break everything. Then you would update all the labels that don't match their current name by looking at the most recent version of pokered. It's maybe a better idea to look at the related commits rather than the files. I think what you need is this commit and the nicknaming screen fix from this other commit. I would like to be able to remap the sprite IDs to my custom icons now...Does anyone know where in the code the Helix gets assigned as Party Icon sprite ID 2? It's not located in the pointers with the others (goes straight from Ball to Clefairy...?) I've been looking around but I can't seem to figure out how it assigns the Helix sprite as a party icon in the first place. It appears that changing the pointer data for the menu Ball sprite directly affects the Helix, but only insofar as to what sprite graphics it loads...I noticed there was a function related to the two of them, but it appeared to only be animation related. While I'm at it, I'm wondering if it is possible to expand the number of pointers in this table as well...the reason I ask is because after the pointer for the first frame of the last "MonPartySprites" character ("Quadraped"...?) 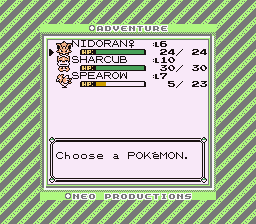 it simply jumps back around to the Rhydon ("slowbro") sprite's second frame pointer...I'm sure it's just a matter of telling the game how many entries there are, but I can't quite figure out where that code is, either. Okay! Update on this issue: I was able to fix the issue with the pointers corresponding to only 1/4 of the sprite (updated the number for vSprites + [value] to be + $40 instead of + $20 from the previous) but still have no idea idea how to expand the pointer table or remove the weird functionality for the Ball and Helix entries...still, this is progress! yay! It appears as though the second frame of every sprite is determined in the pointer table not by its physical location in the list but by the "vSprite + [value]" ...would appear whatever entry is + $400 higher than the previous entry's vSprite value become the second frame. I could be totally wrong, but by my experimenting, that is what I came across. It also severely limits how many sprites I could fit in to the list if this is true :( I will keep researching this further, unless anyone has any suggestions. EDIT: Further update! under LoadMonPartySpriteGfxWithLCDDisabled, there is a "ld a, $1c" which hardcodes the entire number of entries in the pointer table. This too must be updated. That answers my question of how much I can increase it by, I guess (I hope?) Also, I was able to disable the routine which forces Ball and Helix in to a single bouncing frame as opposed to an animated sprite sprite, but still have no idea what code is at play to determine where the Helix entry is getting loaded from. If anyone has insight, that would be fantastic. EDIT EDIT: .....oh....kay. So, it turns out all you need to do is set a pointer entry in the space between Ball and Fairy (and increase the table length to $1e) and make sure that it corresponds to vSprite + $80 and it automatically becomes assigned to the helix slot? wh....I'm not going to pretend I understand <i>how</i> this works, but it does work, so okay, not gonna argue.....heh. I'll probably write up a tutorial here in a bit on how to do all of this using the original icon engine. back to the drawing board. I guess I will need to come up with a new method of loading the sprites in to memory than what the normal engine does. Originally, there are only 10 party menu sprite ids. Since there are so few, all 10 can be loaded into vram before exactly which sprites are needed is determined. When the sprites are being loaded, the actual address of the helix sprite, OmanyteSprite (omanyte.2bpp), is never directly referenced since it is in rom immediately after BallSprite (ball.2bpp) which also must be loaded. You might notice that MonPartySpritePointers references BallSprite, which is a single 2x2 tile image. Since each tile is $10 bytes, this image must be $40 bytes. But MonPartySpritePointers says to load $80 bytes starting at BallSprite. This guarantees that the helix sprite will be loaded and also that it will immediately follow the ball sprite in vram. Secondly, GetPartyMonSpriteID gets the sprite id for the currently loaded pokemon from MonPartyData. Remember that valid numbers for this id are from 0 to 9. But before this routine returns the result in a, it actually returns the id << 2. This guarantees that instead of returning $0, $1, $2, $3, $4, $5, $6, $7, $8, or $9, it returns $0, $4, $8, $c, $10, $14, $18, $1c, $20, or $24. If you run the game in an emulator like bgb and open the vram viewer while the party menu is open, you will see that these values correspond to the tile ids of each sprite. For example, SPRITE_HELIX has the value 2. So 2 << 2 is 8. In the vram viewer, tile $8 is the base tile for the helix sprite. Next, you might notice that the return value (from GetPartyMonSpriteID) that is in register a immediately gets stored in wOAMBaseTile, which gets used by WriteAsymmetricMonPartySpriteOAM and WriteSymmetricMonPartySpriteOAM when constructing the oam data for each pokemon in your party. I'm not sure how much of this helps clear up some of your confusion, but I hope some of this information is of use to you. It should at least solve the mystery of how the helix sprite gets correctly loaded and used. 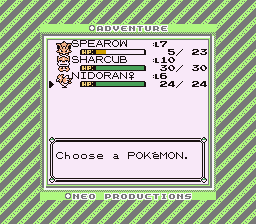 I have everything working except for the Nickname screen; managed to port in everything I believe, any special tweaks to the naming screen? That looks like the changes I was expecting to have to make! Its been about a year and a half since I tinkered with this so I'm getting back in the saddle. Thanks for pointing that out! I know this is an old post, but I want to add this sprite to the party menu, should I proceed to do aaall these steps? Following up, as it appears I imported all of the changes correctly so its got to be something odd I missed; on switching the Pokemon in the menu, the newly positioned pokemon do not match their icons, they match their old icons. Anyone else run into this? Near as I can tell, its not updating the index properly. When I reload the menu, the sprites are the proper sprite, but do not update on shifting them. RedrawPartyMenu_ is called after two mon switch positions. The party sprites don't have to be reloaded because in the original game, every one of the party sprites is already loaded, and the order of the sprites in memory is the same no matter what, regardless of the mon in your party. In your hack where you have added a unique sprite for each mon, obviously not every sprite is in memory all at once. Instead, only the ones that are needed are loaded, and they are deliberately in the same order as the mon in your party. So the sprite graphics need to be reloaded. Quick Edit: Any way to address the flicker/garbage that appears on the redraw? I don't know what you mean by garbage. Hm, I've never seen something like that. Are you sure you disabled the LCD while writing to VRAM? EDIT: If you pause the video just right, it's actually not garbage. It's the overworld. But no sprites are drawn and its using the party menu palettes. Yup, routines have the LCD Disabled and re-enabled as appropriate. My core ASM is a little old so the function names don't always line up but its there~ Both on the old routines and the ones I imported as a part of this feature.